As the Shiva trilogy goes on, Amish continues to weave the magic of mixing the fiction with his words.The story of the great Mahadev takes further turns as he discovers not only new things from his journey but also leaves many thoughts for the reader to pick up along the read.The enlightening conversations with the different Vasudevs which Shiva has all along show how a person discovers the good among himself & most importantly the fact that there is no absolute evil or good but a balance of good & evil in everyone.All this in the most intriguing way. 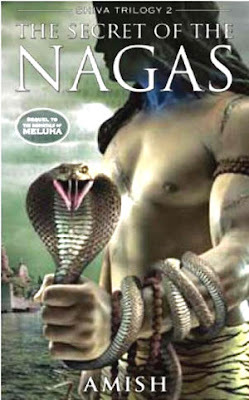 However, the catch of the book is not just its mighty protagonist but the characters associated with it.The valiant Sati & her intelligence which so wonderfully complements the lord is delightful & inspiring in her own way.The faith of Nandi, Bhagirath & Parvateshwar & many more whom the lord befriends on the way is simply worth knowing about.The secrets which keep opening one after the other are just enough to keep one engrossed to the book till the end, until a yet another to be continued which starts the wait for the last part of the book because the secret of the Nagas very well remains just uncovered. As an author Amish completely does justice to the second part too unlike other sequels which usually get shadowed by its main book.The pace & the description very well matches with the part one & hoping the same for the last part of the trilogy too.